Serial Number:… SE04513 circa 2000 Neck:… Maple neck, 1.650″ nut width, 25.5″ scale length, U shaped neck profile. Frets:… Very minor wear Body:… Ash body. Finish:… Butterscotch Blonde nitrocellulose finish with three minor checks in the finish. 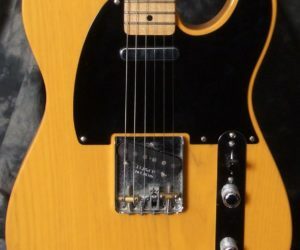 Hardware/electronics:… American Vintage Telecaster pickups and hardware, McVay G Bender installed. Playability/Action:… Low fast action at 4/46″ bass and treble sides. Case:… Original tweed hardshell. Pricing:… $1499.99 Canadian Dollars (approx.$1508.US$ as of Feb.9/2011).